Heat 2 tablespoons of the oil in a 20cm lidded frying pan with a heat-resistant handle. When hot, add the potato slices and stir them in the oil to coat. Season, then reduce the heat to low. Cover and cook gently for 15 minutes, turning the potatoes once and gently shaking the pan from time to time until they are tender. Remove from the pan and set aside on a plate. Tip the frozen vegetables into the pan, increase the heat slightly and stir-fry for 2-3 minutes until starting to soften. Beat the eggs together lightly in a large bowl. Stir the potatoes and vegetables into the egg mixture and mix thoroughly. Return the pan to the heat and add the remaining oil. When hot, pour in the egg mixture and reduce the heat to low. Cook for 20-25 minutes, without stirring the mixture, until there is virtually no raw egg left on the surface. Preheat the grill to high. Place the pan under the grill for 2-3 minutes until the tortilla is set and golden brown. Leave to stand for 5 minutes before cutting into wedges. 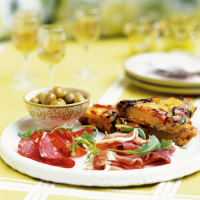 Arrange the meats on a platter and place the olives in a small bowl. Serve with the warm tortilla wedges. Cook's Tips The tortilla can be made a couple of hours in advance - it is equally delicious served cold. The tortilla can be made a couple of hours in advance - it is equally delicious served cold. If you do not have a lidded frying pan, cover your pan with foil when cooking the potatoes.